There are lots of ‘Klaus’ software titles on the market, either imitating or reproducing by sample technology the various Hammond and Wersi sounds of the late, great, Klaus Wunderlich - and some are very good indeed. There seems to be no end, though, to the popularity of this sound and I’ve come across a new piece of software that I absolutely love! I’m sure the Klaus fans amongst you will too. a)A USB stick that contains everything you need to simply ‘plug in and play’ - without the need to install expensive additional memory modules. b)Eight excellent basic registrations that each call up settings for a different style of music. e)A superb collection of edited Organ Flutes for ‘Hammond H’ and European organ sounds. When you plug the USB stick into the port on the Tyros4 and press button J (to access the registrations) the USB page displays four folders labelled ‘Custom Pads’, ‘Drawbar Presets’, ‘Edited Voices’ and ‘Styles’. You can actually ignore all of these because these folders are where the edited data is stored that goes to make up the registrations that you’ll call up whenever you use the sounds from the Klaus-4-Tyros package. Note: Because the registrations are linked to data in so many folders it’s advised (and far easier) to use the software with the USB stick in place. You can download it to your Tyros4’s hard drive of course if you’re determined enough - but you’ll need to be pretty confident about working with the keyboard’s file management structure if you do. Having told you which folders to ignore let’s move on to the file you need - which is at the bottom of the page labelled ‘Klaus-4-Tyros’. This is the one and only registration file and, at first glance, I thought this was rather little to show for the price of the package... but further investigation revealed how wrong I was. Actually it works very well indeed because this is the only file you need to load. Everything else (bar the playing of course) is done for you. As with all registration files, the EDIT button at the bottom of the screen displays any available information about each of the registration settings contained in the bank. So, when I selected the Klaus-4-Tyros file followed by [EDIT] the eight registrations appeared in the screen. Each registration is dedicated to a different style of music. If you’re a keen Klaus fan, you’ll have few problems marrying a tune from one of his many albums to each setting... and I spent quite a long time quite happily playing with these ‘basic’ registrations before I started to explore further. When I did, though, I began to realise how well put together this package is. Each basic registration is linked to a customised style which, in turn, is linked to four customised one touch settings. This means that each time you call up the ‘basic’ registration (e.g. Cherry Cha-cha) you get another four melody voice settings to go with it. This gives you a total of 40 melody voice settings from the eight basic registration buttons. It gets better because, in addition to this, customised multi pads have also been assigned to each style. These are an absolute delight. Firstly, because Jason Lee who created all the settings obviously has a keen ear for the Klaus-type fills and frills that are sprinkled throughout the Wunderlich recordings. Secondly, because having recorded the multi-pads he hasn’t tried to quantize the content. This means that the musical ‘frills’ have a live feel to them that makes them all the more enjoyable when you hear them mixed in with a performance. Jason also owns and regularly plays the Wersi model Helios that was made so famous by the German virtuoso - and, to my ear at least, his sounds are spot on. I really enjoyed playing with these registrations and the associated styles, custom voices, custom styles, and custom multi-pads. I think the whole package is extremely well thought out and would whole-heartedly recommend it to anyone who wants to play tunes with some great Klaus-type European organ sounds - with the minimum cost and with the minimum of fuss. 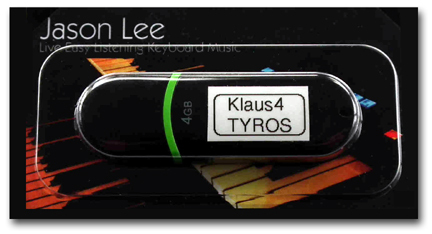 If you’d like to audition the Klaus-4-Tyros package you can hear Jason himself using the settings he’s created as he plays a selection of music on the online broadcast channel You Tube. Jason doesn’t profess to being a ‘concert’ player but this is all to the good because the demon-stration he gives on You Tube is really impressive and leaves you with the genuine impression that the package is very playable - as indeed it is. Important - Overseas customers: Our online shop does not calculate overseas postage charges. Please email us on info@yamaha-club.co.uk for a PayPal invoice.